For a long time, cell or tissue damages induced by ionizing radiation have been attributed to energy deposition in the nucleus of the cells. However, in the past decades scientists have observed impairments in cells, which have not been directly irradiated, but were affected by neighboring irradiated ones. This phenomenon is called radiation-induced bystander effect (RIBE). RIBE is not limited to the first or immediate neighbors of irradiated cells, but has been noticed in cells far from the irradiation site as well. Belyakov et al. irradiated an area of 2 µm in diameter of a skin tissue explants, and observed radiation effects in cells 1 mm away from the irradiated site. Similar results have also been reported in several other studies. ,, Such observations prompted the investigators to try to identify the RIBE extension. Some researchers reported that irradiated cells generate a second wave of bystander signals later on following irradiation. ,, On the other hand, some researchers believe that there should exist an intermediary or relaying system which intensifies the initial signals. , In this article, we are proposing the following hypothesis: Bystander cells affected by target cells are capable to produce bystander signals and contribute to the propagation of RIBE in an area beyond the initial irradiated site. The current study was designed to find out if the experimental results would confirm the proposed hypothesis (second order of RIBE). For this purpose, two cell lines that were able to produce bystander signals and response to them  were chosen. Then successive medium transfer technique was performed to induce RIBE in bystander cells. Two bystander cell groups were considered; first bystander cells, which were exposed to conditioned medium extracted from irradiated cells, and second group of bystander cells, which received conditioned medium from the first bystander cells. The latter medium was fresh medium that substituted the transferred medium in first bystander flasks. Normal human lung fibroblasts (MRC5) and human lung carcinoma (QU-DB) cell line were obtained from Pasteur Institute in Tehran, Iran. MRC5 cells were grown in DMEM culture media (Gibco, Germany) supplemented with 20% fetal bovine serum (Biosera, England), 100 µg/ml streptomycin, 100 U/ml penicillin (Biosera, England), and 2 mM l-glutamine (Biosera, England). QU-DB cells were grown in RPMI-1640 media (Biosera, England) supplemented with 10% fetal bovine serum, 100 µg/ml streptomycin, and 100 U/ml penicillin. The cells were incubated at 37ºC in a humidified atmosphere of 5% CO 2 . Two days prior to irradiation, sub-confluent cells, MRC5 (3.0 × 10 5 ) and QU-DB (2.5 × 10 5 ) were trypsinized and cultured in 10 cm 2 flasks. Three main groups were defined: Target group, first and second bystander groups. As in our previous study,  RIBE was observed in MRC5 and QU-DB cell lines following irradiation of 0.5, 2 and 4 Gy, where the same doses were applied in the present study to investigate second order of RIBE (SRIBE) in the same cell lines. For this purpose two hours prior to irradiation, media of target flasks were replaced by 7.8 ml fresh medium such that medium height in the flasks were 0.5 cm; therefore, cells attached to the bottom of the flasks were at the build-up depth of 60 Co gamma rays, where the maximum radiation dose is delivered. Cultures were irradiated by gamma rays emitted from a 60 Co Tele therapy unit (Theratron, Phoenix model, average dose rate of 0.72 Gy/min) at room temperature. The field size was 15 cm × 15 cm and source to surface distance was 70 cm. The flasks were placed on a water phantom (30 cm × 30 cm × 10 cm), which is used for dosimetry and following irradiation they were returned to the incubator. One hour after incubation, media of target flasks were harvested and filtered through 0.22 µm acetate cellulose filter (Orange Scientific, Belgium), and were transferred to first bystander flasks. The reason for filtering was to ensure no target cell was present in the transferred media. First bystander flasks were incubated for one hour. At this stage, the transferred media were removed; cells were washed with phosphate-buffered saline (PBS), and were received fresh media. Finally, after two or six hours, fresh media were transferred to the second bystander cell group. The reason for examining two post-incubation times (two and six hours), was to find out which time is sufficient for first bystander cells to produce bystander factors in the fresh media. Control groups were conducted as the first and second bystander groups, except that they received medium from sham-irradiated cells. Cytokinesis block micronucleus assay was performed to measure the amount of chromosomal damages (RIBE level) induced in both first and second bystander cells. Following the last medium transfer, 2 µg/ml of cytochalasin B was added to MRC5 and 0.8 µg/ml to QU-DB bystander cells. MRC5 and QU-DB flasks containing cytochalasin B were incubated for 45 and 24 hours (1.5 doubling time), respectively. Following incubation, media of flasks were removed, the cells in the flasks were washed with PBS and were fixed as described in previous study. In brief MRC5 cells were fixed once with pure methanol and QU-DB cells with a combination of methanol and acetic acid in the ratio of 3:1 for three times. After drying, cells were stained with 5% Geimsa for 7 minutes and viewed at 400 × magnification. In each slide, at least 1000 binucleated cells were scored and the frequency of binucleated cells containing micronuclei (MC) was determined. To investigate the role of reactive oxygen species (ROS), the conditioned medium extracted from 4Gy MRC5 irradiated cells were combined with dimethyl sulfoxide (DMSO) (1%) and then were transferred to the first bystander group. After an hour, conditioned medium containing DMSO was discharged, cells were washed in PBS, and fresh medium substituted the discharged ones. Finally, after two hours, fresh medium was transferred to the second bystander cell group. All data acquired in this study were distributed normally; therefore, the statistical analysis was performed at 95% confidence level by applying one-way analysis of variance and Tukey's multiple comparison tests. The numbers of MC in second bystander cells which received medium after two and six hours were not statistically different (date has not been shown). Therefore, "two hours" was considered as a sufficient time interval for generating bystander signals in first bystander flasks, and consequently in the next experiments, medium transfer from first bystander cells to second ones was performed after two hours. [Table 1] represents the number of MC in QU-DB second bystander subgroups. Based on P values in column 4, the number of MC for 2 and 4Gy unlike 0.5Gy are significantly different than corresponding value in control subgroup. Statistical analysis also revealed that there were significant differences between bystander subgroups at different doses (P < 0.001). MC values for MRC5 second bystander cells and their control group are presented in [Table 2]. There were statistically significant differences in all subgroups compared with their control; however, no statistically significant differences between the bystander subgroups exist (P > 0.05). In order to examine whether RIBE level in second bystander cells is the same, or different from first bystander cells, MC yields of corresponding first and second bystander subgroups were compared. Corresponding subgroups were those, which had the same target cells. Statistical analyses revealed that the frequency of MC in corresponding subgroups were not different (P < 0.05) expect for MRC5 at 2Gy (P = 0.034) and QU-DB cells at 4Gy (P > 0.001). Data are represented in [Figure 1]. DMSO decreased the frequency of MC in both first and second MRC5 bystander cells [Figure 2]. MC values in both first and second bystander cells treated with DMSO were not statistically different than corresponding value in control group (P > 0.05). This observation indicates that RIBE disappeared as a result of DMSO treatment. The present study was designed to investigate, whether bystander cells can induce RIBE in non-irradiated cells and contribute to RIBE propagation. The results are evident that first bystander cells following to be affected by irradiated cells can produce and release bystander signals in culture medium. The reason is that the media received by second bystander cells were not those which were extracted from target cells, rather they received the fresh media substituted the old ones in first bystander flasks. 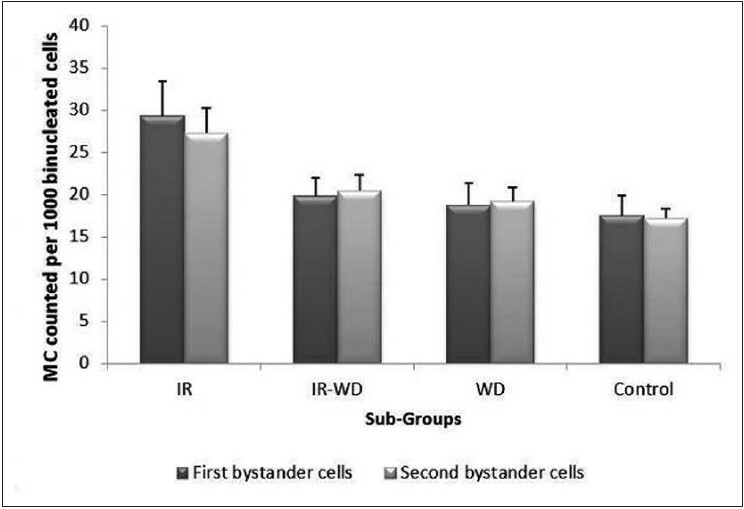 Therefore, we concluded that the effects observed in second bystander cells are due to bystander factors produced and released in the fresh media by first bystander cells. The induction of radiation effects in non-irradiated cells by cells, which have not been irradiated themselves, have been reported by other researchers. Ponnaiya et al. witnessed that progenies of irradiated cells, which were not irradiated, but were carrying genomic instability (GI), could induce GI in non-irradiated cells. Induction of bystander effect by progenies of bystander cells has been also observed by Rugo et al. These results support our finding, although cells responsible to induce bystander effect in non-irradiated cells are different in the aforementioned studies. Several studies have examined the spatial extent of RIBE. , In a study carried out by Belyakov et al., radiation effects were observed in cells located as far as 1 mm from irradiated site  , whereas the irradiated area was only 2 µm in diameter. To describe this observation, authors predicted that there is an intermediary system to relay and amplify the bystander signals. Hu et al. shared the same interpretation of identical observation. Findings of the present study are in agreement with the prediction of the aforementioned researchers and propose that bystander cells are one of the components of intermediary relaying system. If similar results would be obtained in other cell lines, it may be suggested that soluble factors propagated in the cell environment are those produced by both irradiated and bystander cells. In this way, induction of RIBE in cells far from irradiated site can be explained, as signals can be amplified by bystander cells in the midway of RIBE tracks. Propagation of RIBE in a large area and the involvement of bystander cells as RIBE transmitters may be considered an important subject in radiation protection, where low doses are implied. As in previous studies, , we found RIBE in QU-DB and MRC5 cells at doses of 0.5, 2 and 4Gy, the same doses were applied in this study. However, the same study should be performed with very low dose to find whether RIBE signal can be produced, and propagated by bystander cells at environmentally relevant low doses, similar to the present study. The authors thank the office of Vice-President for Research of Mashhad University of Medical Sciences (MUMS) for funding this work. The authors are also grateful to Omid hospital for making use of Co-60 teletherapy unit possible. This article is based on the results extracted from MSc thesis presented to medical physics dept. of MUMS. 1. Belyakov OV, Mitchell SA, Parikh D, Randers-Pehrson G, Marino SA, Amundson SA, et al. Biological effects in unirradiated human tissue induced by radiation damage up to 1 mm away. Proc Natl Acad Sci USA 2005;102:14203-8. 2. Hu B, Wu L, Han W, Zhang L, Chen S, Xu A, et al. The time and spatial effects of bystander response in mammalian cells induced by low dose radiation. Carcinogenesis 2006;27:245-51. 3. Lyng FM, Seymour CB, Mothersill C. Initiation of apoptosis in cells exposed to medium from the progeny of irradiated cells: A possible mechanism for bystander-induced genomic instability? Radiat Res 2002;157:365-70. 4. Wang T, Li F, Xu S, Bian P, Wu Y, Wu L, et al. The time course of long-distance signaling in radiation-induced bystander effect in vivo in Arabidopsis thaliana demonstrated using root micro-grafting. Radiat Res 2011;176:234-43. 5. Han W, Wu L, Hu B, Zhang L, Chen S, Bao L, et al. The early and initiation processes of radiation-induced bystander effects involved in the induction of DNA double strand breaks in non-irradiated cultures. Br J Radiol 2007;80:S7-12. 6. Zhang Y, Zhou J, Baldwin J, Held KD, Prise KM, Redmond RW, et al. Ionizing radiation-induced bystander mutagenesis and adaptation: Quantitative and temporal aspects. Mutat Res 2009;671:20-5. 7. Gerashchenko BI, Howell RW. Cell proximity is a prerequisite for the proliferative response of bystander cells co-cultured with cells irradiated with gamma-rays. Cytometry A 2003;56:71-80. 8. Soleymanifard S, Bahreyni MT. Comparing the level of bystander effect in a couple of tumor and normal cell lines. J Med Phys 2012;37:102-6. 9. Soleymanifard S, Toossi MT, Sazgarnia A, Mohebbi S. The role of target and bystander cells in dose-response relationship of radiation-induced bystander effects in two cell lines. Iran J Basic Med Sci 2013;16:177-83. 10. Ponnaiya B, Jenkins-Baker G, Bigelow A, Marino S, Geard CR. Detection of chromosomal instability in α-irradiated and bystander human fibroblasts. Mutat Res 2004;568:41-8. 11. Rugo RE, Mutamba JT, Mohan KN, Yee T, Chaillet JR, Greenberger JS, et al. Methyltransferases mediate cell memory of a genotoxic insult. Oncogene 2010;30:751-6. 12. Fournier C, Becker D, Winter M, Barberet P, Heiss M, Fischer B, et al. Cell cycle-related bystander responses are not increased with LET after heavy-ion irradiation. Radiat Res 2007;167:194-206. 13. Koturbash I, Rugo RE, Hendricks CA, Loree J, Thibault B, Kutanzi K, et al. Irradiation induces DNA damage and modulates epigenetic effectors in distant bystander tissue in vivo. Oncogene 2006;25:4267-75. 14. Konopacka M, Rzeszowska-Wolny J. The bystander effect-induced formation of micronucleated cells is inhibited by antioxidants, but the parallel induction of apoptosis and loss of viability are not affected. Mutat Res 2006;593:32-8.